At Camp Ta-Kum-Ta we’re always looking for passionate, fun-loving, kid-loving volunteers to create special moments for our children. And with the expansion of our programs, we need more volunteers than ever! 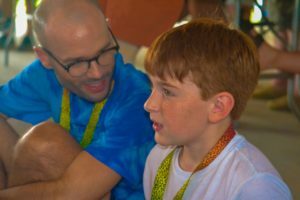 If you think you have what it takes to create special moments in the lives of our children, please apply to volunteer for one of our 2019 programs by clicking HERE. Volunteer for a Day at Camp Ta-Kum-Ta! If you have applicable skills and want to volunteer, we’re looking for help with our Annual Work Schedule! Camp Ta-Kum-Ta is now scheduling groups (up to 85 people) to come up to camp for a day or a half day to help us get ready for our annual programs. Camp Ta-Kum-Ta has a lot of events throughout the year and we are always looking for volunteers to help at the events! Check out our event calendar to see what’s coming up! Also keep an eye out on Camp Ta-Kum-Ta’s Facebook page for our volunteer needs.